Chief Minister Smt. Vasundhara Raje’s announcement to increase air connectivity between major tourist destination cities of the state would rollout intra-state air services from next week. State government’s Civil Aviation Department signed an Air Services Operation Agreement to this effect with the Supreme Air Lines on Thursday at State Secretariat. 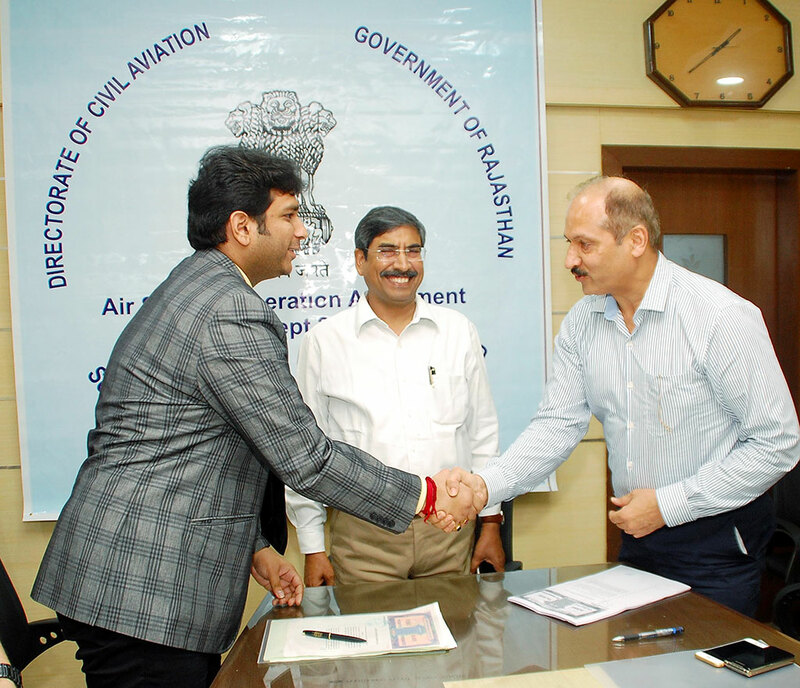 Director of Civil Aviation Shri Kesari Singh and President and CEO of Supreme Transport Organization Pvt Ltd Shri Ammeet K Agarwal signed this agreement on behalf of the state government and the airlines respectively. Principal Secretary General Administration Department and Civil Aviation Shri Pawan Kumar Goyal was present on this occasion. In the first phase, flights would start from Jaipur to Jodhpur and Udaipur next week. Thereafter, flights would operate from other cities as well for air service to tourists, businessmen and others at cheaper rates. Supreme Air Lines would operate intra-state flights for six days in a week with 9-seater plane Sesana Caravan-C 208B. The flight would start from Jaipur at 10:15 AM to reach Jodhpur at 11:30 AM and fly back at 11:45 AM hours from Jodhpur to reach Jaipur at 13:00 PM. At 4:30 PM, the plane would fly from Jaipur to reach Udaipur at 6:00 PM and fly back at 6:15 PM from Udaipur to reach Jaipur 7:45 PM. For both these flights, minimum airfare has been fixed at Rs. 3,499 per ticket. Tourism, heritage and business sectors would get a boost with launch of this air connectivity service in the state. Several locations of world-class tourism, religious, historical and heritage importance would be benefitted out of these air operations.